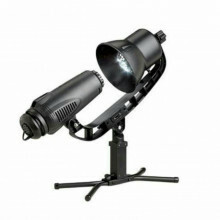 ez up 2-in-1 light show holiday projector projects moving or stationary images. 3-speed motor allows you to select fast, medium or slow movement of images mirror ball rotates 360° to project images moving up, down, side-to-side and diagonally. durable and weatherproof for indoor/outdoor use 58" black lead cord up to 60ft. wide projection area easy assembly. sets up in minutes.